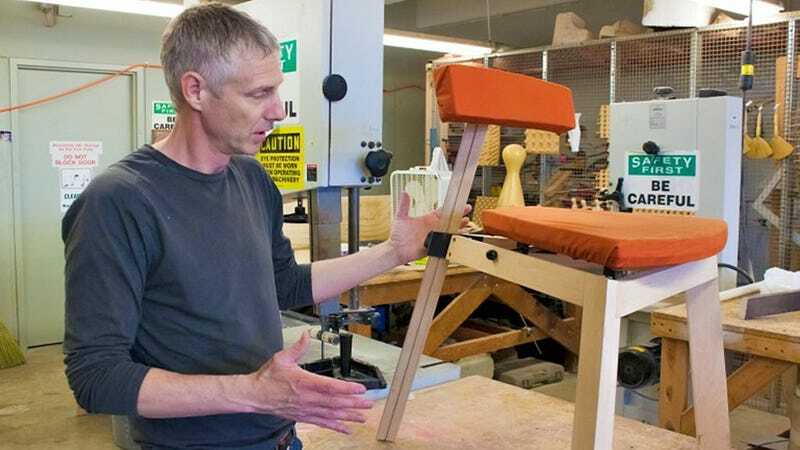 A push for better ergonomics has vastly improved office chairs, so interior design professor David Brothers took those same ideologies and created a better chair for musicians. Not only does it improve their posture making it easier to sit longer, but it also helps improve their performance. Musicians in an orchestra are accustomed to all sitting in the exact same chair, whether they play wind or string instruments. But 18 months of research, including extensive interviews with professional musicians, led Brothers to design an ergonomic alternative that can be further customized for different instruments and playing styles. The chair's seat can be tilted forward and back to "reduce the strain of the backward pelvic rotation" and together with the backrest can also be raised and lowered for better lumbar support. So in other words, it minimizes back pain. Brothers also chose carbon fiber for the frame so it's lightweight and easy to re-position, but also because it's strong and flexible allowing it to absorb the strong motions of a musician while they perform. Apparently, very few of the performers Brothers spoke to cared about aesthetics. But as an interior designer, his creation still has a definite minimal charm to it. Now someone just needs to fund his vision so the design becomes a reality. We suspect both Eames and Beethoven would have chipped in.